Using raised beds for your vegetable garden is not required but it does offer several distinct advantages over having your vegetable garden on the ground. Proper irrigation of your vegetable garden is critical to its success. Proper watering not only increases the yield of your garden but it also helps to control diseases and insect populations. Organic vegetable gardening is the practice of growing your garden without the use of dangerous chemicals and other practices that hurt the environment and your garden. Pest control is a key to any successful garden. We'll look at a few different way to protect your garden from pests, animals, and insects. One of the keys to a successful vegetable garden is the health of your soil. Adding compost is a great way to enrich your garden soil and keep it healthy from year to year. There are several ways of getting compost, including making your own. One of the least understood of the 'edible' gardens is the edible flower garden. From old standards like roses and chrysanthemums to more exotic edible flowers this type of garden can add new colors and flavors to your harvest. Here are some useful articles about planning your vegetable garden. Here are some articles about plant maintenance. 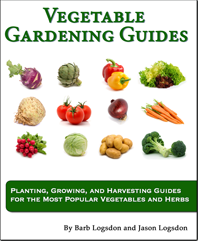 Our vegetable garden guides will help you successfully grow over 90 vegetables and herbs. Each guide has all the information you need, taking you from planting through to harvesting.